After their first flight to Camiguin in December 2017, Skyjet now officially announces that they will offer direct flights MNL – CGM – MNL from May 6, 2019. Originally Skyjet wanted to start their Camigiguin operation already in 2018. Unfortunately the company encountered two accidents. Twice a plane overshot the runway. Once in Siargao and once in Coron. Let’s hope that this won’t happen again. Flight M8-511 leaves Manila terminal 4 at 09:50 AM and arrives in Camiguin at 11:10 AM. Flight M8-512 takes off in Camiguin at 11:40 AM and lands in Manila terminal 4 at 01:10 PM. Fares change every day. They are ‘naked’ fares, meaning that Skyjet will add taxes and fees. In other words a PHP 3,283.04 ticket will finally cost PHP 4,023.68. 10 kilograms of checked luggage are free. You can also bring 5 kg hand-carry. Additional baggage is not possible because of the short runway in Camiguin (only 1202 meters). 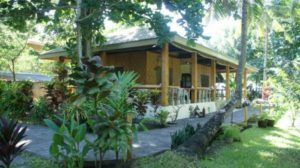 “Casa Roca Inn” in Naasag is an institution well known on and around Camiguin. Funky Jim and Magic Evelyn are masters of kitchen and entertainment. But that’s not new??? Their new Bug-Ong Operation (Boo…) will make food lovers happy. They currently finish the overhauling of the old “Kiwi Bar” also known as the “Shardana”. Whispers can be heard that Restaurant & Bar will open in the next days – first half of March 2019. We’re excited to test the new kitchen. Another phoenix will be reborn from the ashes of the past. Within the premises of late “Action Geckos”, Axel is building up an entirely new dive base. Behind this project is a highly skilled team. Sorry no names for now, but I am sure, you know them. Black Beach Divers is on Facebook. Operation should start by end of March or early April 2019. See also below. The Beach House has already opened within the premises of late “Action Geckos” in Agoho . Adrian is known here in Camiguin for his tasty budget menus. You start at 100 Pesos and won’t exceed 200 Pesos. For now the Beach House is currently open from 7:30 AM to 4:30 PM from Mon to Sat. These opening hours will be extended, once the guestrooms will be available. Mathew is new to Camiguin. Mat and his strong crew are currently doing another “Phoenix Operation” in Yumbing. Chef Mathew before cooked in good restaurants over in Dumaguete. This will be his first independent business. The crew just told me that they plan a soft opening on Friday March 8, if the work is going on as scheduled. Mat’s could become a new culinary hot-spot in Camiguin. This news came in from Benoni port update just an hour ago. Do you remember old Doña Pepita.? The old lady has been overhauled and sails again 3 times a day between Benoni and Balingoan. We hope it’s not only a bit paint makeup, but an in depth renovation. The Fast Cat Ferry did not last for a long time. First they had operating hours that didn’t attract many foreign tourists. Then their fares were off-limits for local people. And finally they had an accident in Balbagon port. Fortunately Super Shuttle Ferry is sailing every day to Bohol and back. They even have accelerated the ferry’s speed and ply the route now in only 3 hours. But what will happen during Holy Week? The once lush site of Tuasan Falls now looks rather like the Nazi “Atlantic Wall” during World War II. Lost forever! immer wiedermal komme ich auf deinen Blog um die letzten CamiguinNews zu hören. Jetzt bin ich auf der Suche nach Ferrys von Jagna nach Cagayan de Oro und sehe, dass FastCat schon wieder zusammengepackt hat … Super! Leider wird unsere Routen Database von Google gestört. Wir sind daran das ganze neu mit Mapbox zu programmieren. Eine recht komplexe Sache. Liteferries war bis jetzt nicht auf meinem Radar. Vielleicht trifft man sich mal bei Perry oder im Seascape? Thanks for the reply. CU at Seascape.